WHITE PLAINS, N.Y., January 6, 2009 - The USTA announced today that Lucy S. Garvin of Greenville, S.C. officially begins her two-year term as USTA Chairman of the Board and President and will serve on the 15-member board through 2010. Garvin previously served two terms as Vice President and one term as First Vice President and Director at Large of the USTA Board of Directors. A former President of the USTA Southern Section, Garvin previously served as a Board Liaison to the USTA Sections, a member of the Board’s Strategic Planning and Compensation Committees as well as Board Liaison to the Tennis in the Public Parks Task Force. She is a member of the International Committee, and represents the USTA on the Grand Slam Committee and the ITF Junior Competitions Committee. 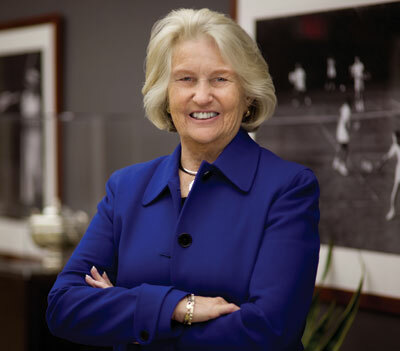 In addition she serves as a board member of both the International Tennis Hall of Fame and the USTA Serves Foundation. After beginning her career as a nurse, she made a major career change when she pursued her strong interest in tennis and assumed a position in management at a tennis facility in Greenville. After serving in this position for 12 years she moved on to become a consultant in the management and marketing of tennis facilities throughout the Southern United States. In addition to promoting the sport she was also successful on the court, playing sanctioned tournaments from 1976-90 and winning a number of doubles titles at the local, state and sectional level. A certified tennis referee for the past 31 years, Garvin has officiated at national, sectional and district tournaments. In 1996, the South Carolina Tennis Association established the Lucy Garvin Volunteer of the Year Award in her honor. She was inducted into the South Carolina Tennis Hall of Fame in 1998 and the USTA Southern Tennis Hall of Fame in 2005. Lucy and her husband, Bob, who is also an avid tennis player, have two children, both of whom were ranked junior and collegiate players. Lucy and Bob reside in Greenville, S.C., within the USTA Southern section but also spend time in their former home in Barrington, R.I.